What is the TEXTJOIN Function? Delimiter (required argument) – The string that is inserted between each text value in the resulting string. The most common delimiters used are a comma or a space character. Ignore_empty (required argument) – The argument helps in determining whether empty cells are included in the resulting string. If the argument is TRUE, it will ignore empty values. If it is FALSE, it will include the empty values in the results. Text1, text2,….text_n – The strings that we wish to join together. The TEXTJOIN function allows us to join 252 strings together. 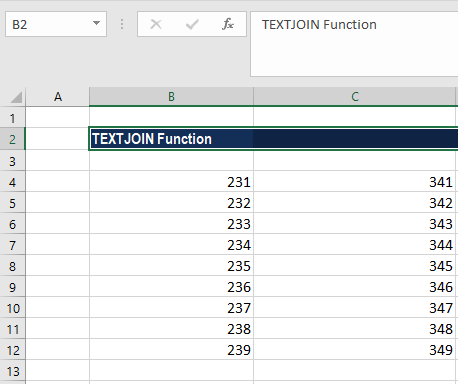 How to use the TEXTJOIN Function in Excel? Let’s see a few examples to understand how this function works. Now let’s assume that we wish to add the text – “Country” before US then in such scenario the formula would change to =TEXTJOIN(” “,TRUE,B6,C6,D6,E6,”Country”,F6). Now suppose we wish to put a space as delimiter. In such scenario, the formula to use will be =TEXTJOIN(” “,TRUE,B7, C7, D7, E7,F7). Let’s see an example of how to join more than two columns (using the data in columns below). Let’s take an example where we are given the name, surname, and date of anniversary in separate columns and we wish to join them. In this scenario, we need to remember that if we directly enter the date, Excel will return a number as Excel store dates in number format. #VALUE! error – Excel will return this error when the resulting string exceeds the cell limit, which is 32767 characters. The TEXTJOIN function can handle 252 text arguments. This function is quite similar to CONCAT function. The difference between the two is that while TEXTJOIN accepts delimiter, CONCAT doesn’t. #NAME? error – Occurs when you use an older version of Excel that doesn’t support this function. #NULL! error – Occurs when we forget to put the comma between the strings we wish to combine. The most important improvement done through the TEXTJOIN function is that it gives the user the flexibility to use cell ranges rather than individual cell references.